My day is not over yet, but I'm having a moment that I suspect many of you have had or will have when taking on the "Whole30"...I consumed a non-"Whole30"-approved substance. Well, the 'jury is still out' (I've sent a message/question to the company to be sure), but I'm going to assume that the grills at "Five Guys Burgers and Fries" have been greased with peanut oil (not Paleo and certainly not "Whole30"). I really just didn't think about it, as I have never done this (grease a grill before adding my burger patties) myself; I knew the fries, sauteed mushrooms and onions would be off limits, but honestly didn't think about the burger patty. A majority (most) of our eating is done at home, where I control the quality of our food and the way in which it is prepared. So, when I normally eat out I focus on eating meat and veggies; I know which oils/fats I should avoid, I know the negative impact of eating such oils, and I also know that most restaurants use said fats/oils, but I try to focus on the big picture and normally feel really good about my choices. Enter today. It was pointed out to me that the burger I had just posted on my Facebook page was likely cooked on a peanut oil-coated grill...totally not Whole30. My face instantly got hot, my stomach felt in knots, I felt GUILT and this weird sense of shame...like I had done something horribly wrong. * Yes, this response really occurred. Throw my hands up in the air, give up, and blow off the rest of the day/weekend...my body's already been tainted, so why not!? Start over again, from Day 1, but do it tomorrow, so I can take advantage of this already blown day. Start over now and just consider the past 10.5 days a learning experience...now I really know what I need to do to "get through this". Keep going strong and consider this to be an 'eye-opening' experience that should not be a regular occurrence. I'll go back to what I said before...this is not about 'showing your body who's boss' or living your life in a guilt-ridden, deprived state of being- this is about awareness and learning what is best for your body. You may not always make the best choices, but always strive to make the best choices. So, I'm choosing Option 4. *I remember a similar experience when, as a vegetarian, I decided to order a filet my first time eating out at a Ruth's Chris steakhouse...I begged Scott not to tell anyone, because how could I ever go back to being a vegetarian, now that I had consumed meat!? Well, I did (fortunately that didn't last too much longer) and as with the peanut oil "incident" it became a learning experience...my body could actually process/digest meat and I actually really enjoyed it. So, thank goodness for learning, growing, adn experiencing. I would do the same thing as you. It was a minimal ingredient, not the majority of your meal. I don't think Melissa and Dallas intentions are to make us neurotic about food but rather change our relationship with it. In my opinion consuming a tiny amount of peanut oil is not like eating an apple pie, so onward and upward! Get back on track. I've had a stressful week and am on Day 19 of my Whole 30; we had a wellness fair today that included a table of Udi's Gluten and Dairy free goodies. Before I even knew it, I had a 1/4 of a double chocolate chip muffin. I felt really guilty afterwards and defeated, but I went to the gym and ran on the track and instantly was able to reframe: this isn't about perfection. This is about learning things about yourself. You didn't plan this cheat; it wasn't lack of willpower (as it def. was with me today), it was accidental. Shake it off and get back in it. You can say eff it in a few weeks. PS that muffin made me sick as a dog. I'm 5 weeks pregnant and sweets nauseate me anyway; not sure what I was thinking trying it. I won't be doing that again. Keep going woman. YOU GOT THIS. I would definitely choose option 4, as well. You're awesome! Keep going! Yes, I also would opt for #4. You didn't consciously sit down and eat a chocolate bar ;) How is your weekend shaping up? I had something similar happen to me earlier this week. I took a bag of dried blueberries from TJ's out of the cupboard and (carelessly, without reading the label) poured a handful into my mouth. I flipped over the package and there it was "SUGAR". Crap!! I literally spit them all out. So, although I didn't chew/swallow them, I'm sure I did absorb some of the sugar but couldn't have been really anything. I would not beat yourself up! You had no idea! I am curious how to handle this as well though. 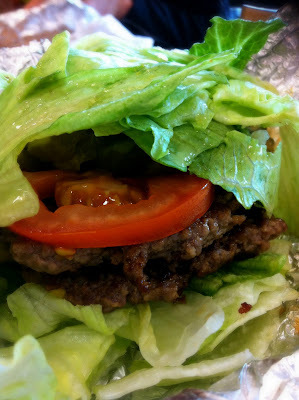 I've gone to restaurants and ordered a burger given the lack of other paleo-friendly things on the menu. But when I got it, it was extremely oily. So should I ask the waiter in the future if it is cooked in oil before ordering? Curious what you plan on doing moving forward. You are doing so great so far - don't let this deter you! Plus your learnings are helpful for all of us as well! Ha! Jen, I know the feeling. While I never actually had an incident like you described during my Whole 30 (really, I just never went out to eat during that month so I could be certain), several times I woke up in the middle of the night in a sweat from a recurring "nightmare". In this nightmare, I had somehow, without thinking, consumed ice cream.... Right after I took that last glorious bite, it would hit me that I had just blown my Whole 30! Lied to my readers, and lied to myself!... I felt a lot better when I realized it was just a dream. I'd probably either do #2 or #4... but lean towards #4. I mean, if you didn't FEEL bad after eating it, and since you don't really know for certain, then I'd say you're good to go! After all, it's more about the spirit of the law, rather than the letter, right?